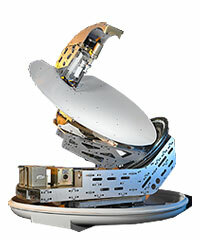 A completely new 1.15m design from Orbit in Israel that supports Ku, Ka or X band systems. OceanTRxTM 4-500 provides multi-band frequency support for Ku, Ka and X bands, based on field exchangeable kits. The antenna uses a single cable between antenna and below deck. Remote monitoring capabilities allow replication of the system interface to any remote PC enabling off-site technicians to remotely monitor and operate the system, or carry out troubleshooting and diagnostics. Rumored to be based on missile tracking systems, this unique, 4 axis, stabilised antenna is impressive, to say the least. It's military origins are evident in the precision machining of the metal components and it's rugged, trouble free performance. 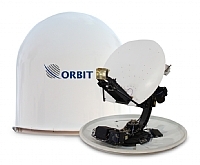 The dish is a highly efficient dual offset Gregorian 1.15m (45") Ku-Band antenna housed in a low loss 1.28m (50") radome. The 3 lower axes are powered and controlled by three identical, and interchangeable SDM modules containing the mechanics and electronics of each drive. These modules are easily replaced with 6 screws. The antenna weight of 270Kg (almost 600 lb) should be taken into consideration when placing the antenna. 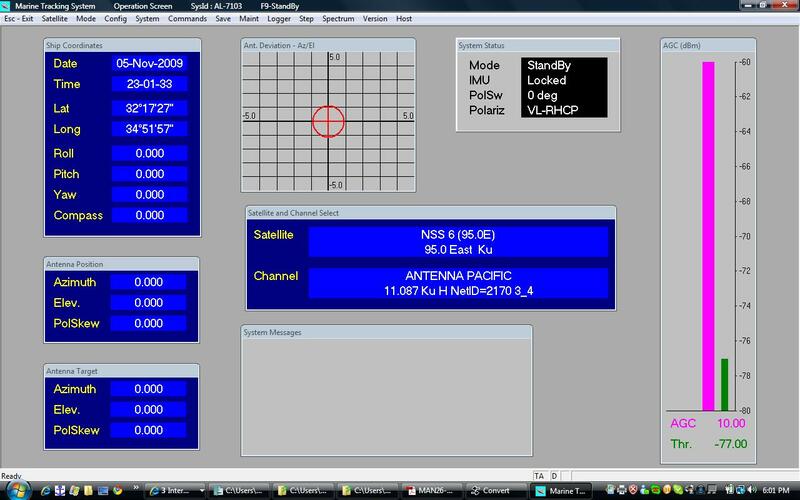 The system has excellent remote software, allowing the antenna to be monitored and controlled over IP from any PC on the ship's network or even, if necessary, from a PC with access to the ship's network on shore. 35445 visits to this page since 28 Nov 2012.